Well, we did it. We welcomed our sweet babe into toddlerhood! I know he isn't officially a baby anymore but he will always be my little peanut. Even when I'm rocking all 22 pounds of him to sleep at night. Because yes, we still rock him. Its my favorite part of the day, except for maybe the sleepy morning snuggles I get when I pick him up out of his crib. As an added bonus for having to postpone Rowan's party, we were all healthy and my parents were able to join us so it was extra special! 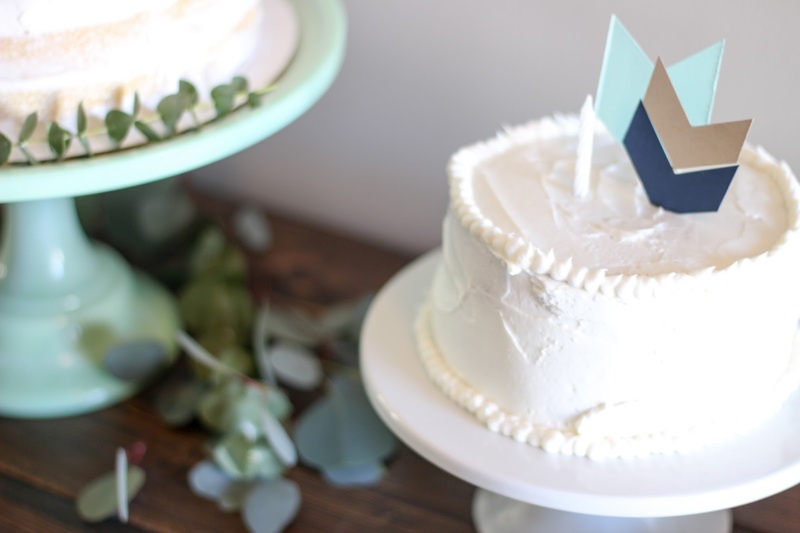 If you remember from my inspiration post, I loved this Minted Into the Woods invitation and decided to base the rest of the decor off of a modern woodland kind of theme. I tried not to go too literal with it but loved the addition the eucalyptus leaves added to the decor! I loved how Rowan's monthly photo display came out. I wanted something different and loved the square prints. I had a lot of requests to share how the 11 AM start time went, and I have to say I think it was great for a first birthday party! 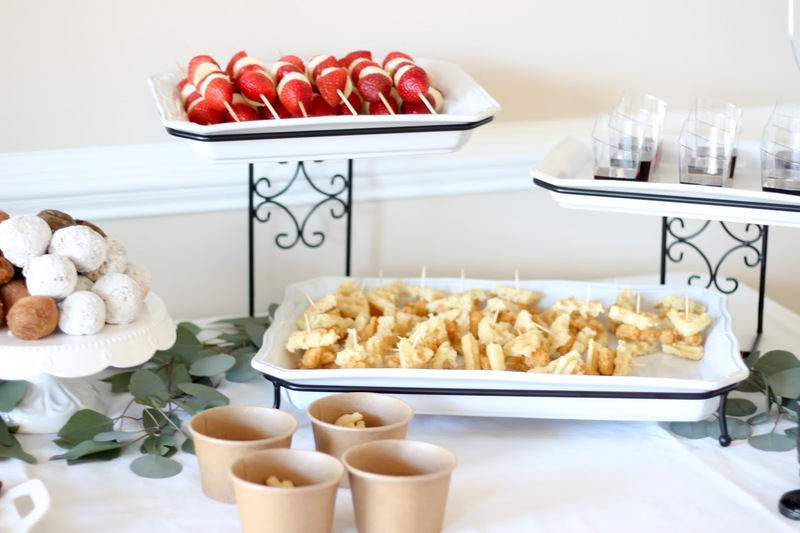 Food is really the main idea of a first birthday party anyway and brunch might just be the easiest thing to put together ever. 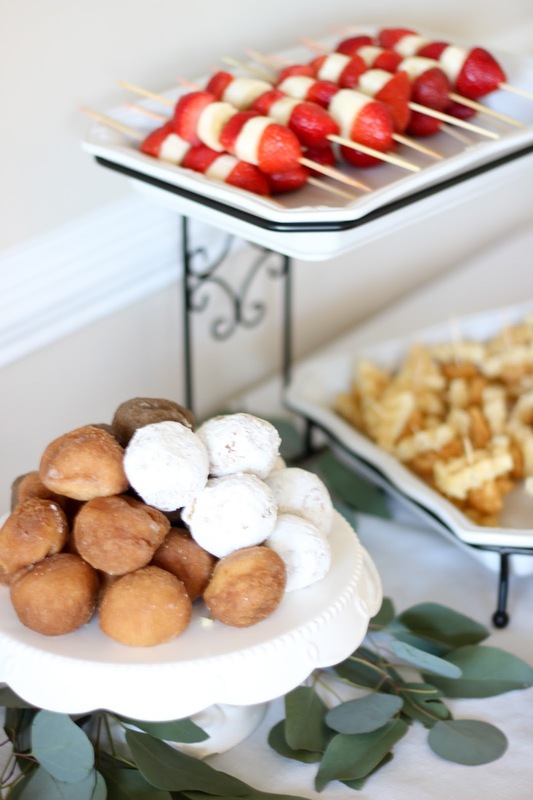 We served chicken and waffles (with popcorn chicken purchased at our local grocery store), strawberry and banana skewers, maple bacon, and donut holes. I think the mini cups of syrup were also a hit. I also threw together some snack cups filled with cheerios and animal crackers for the kiddos. 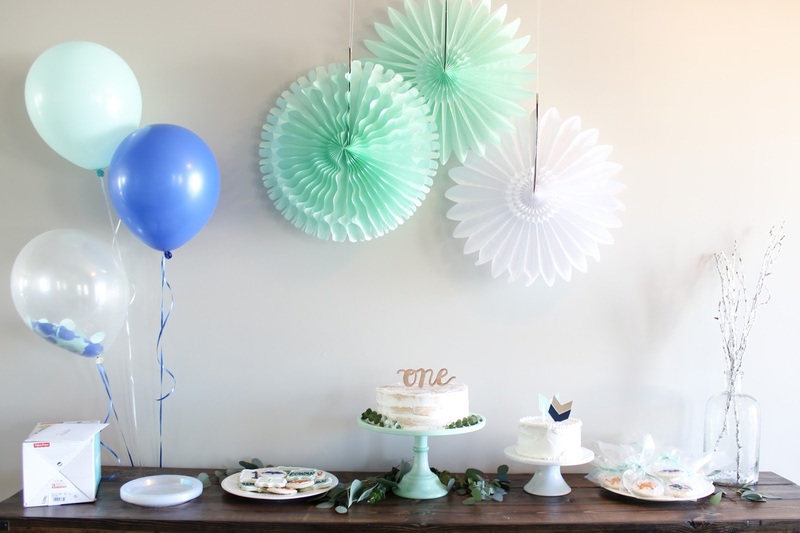 Mint Honeycomb Fan, Mint Petal Fan, and White Petal Fan c/o Minted. 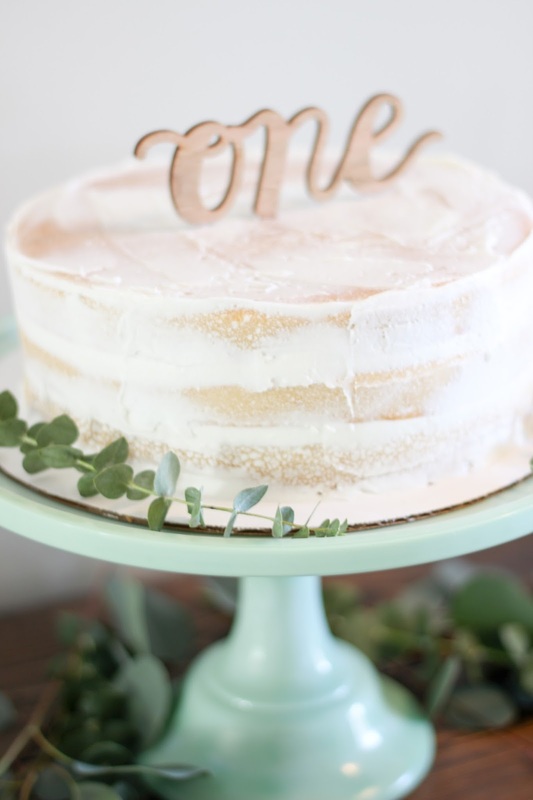 Mint Cake Stand from Home Goods but similar here. 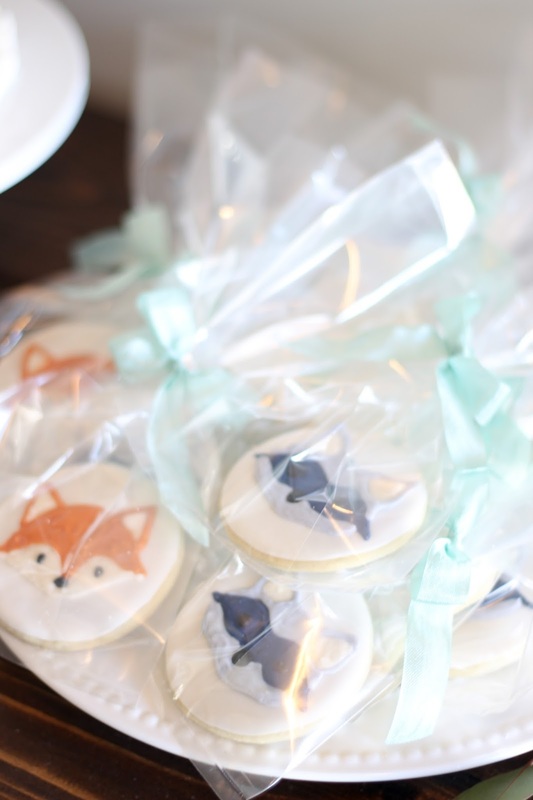 For dessert, I found a local woman who did the most amazing job with the cute little fox and raccoon cookies! They couldn't have turned out more perfect. 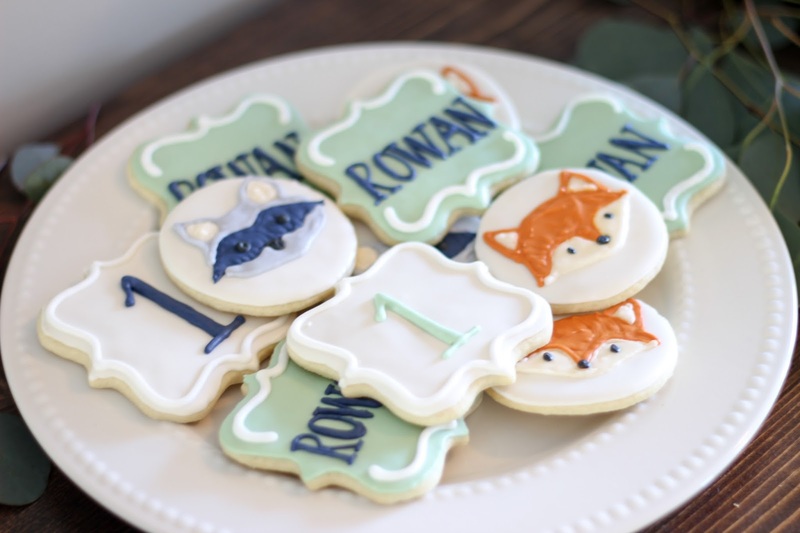 If you're in Charleston and looking for custom sugar cookies, I'm happy to share her info! We served some but also used them as favors by tying some Minted ribbon around a cello bag. We served cake (duh, the best part after the cookies!) and I baked both the "naked" cake and Rowan's smash cake myself because I'm crazy. Rowan reacted to his smash cake pretty much the same as he did for his cake smash photos.. very focused. 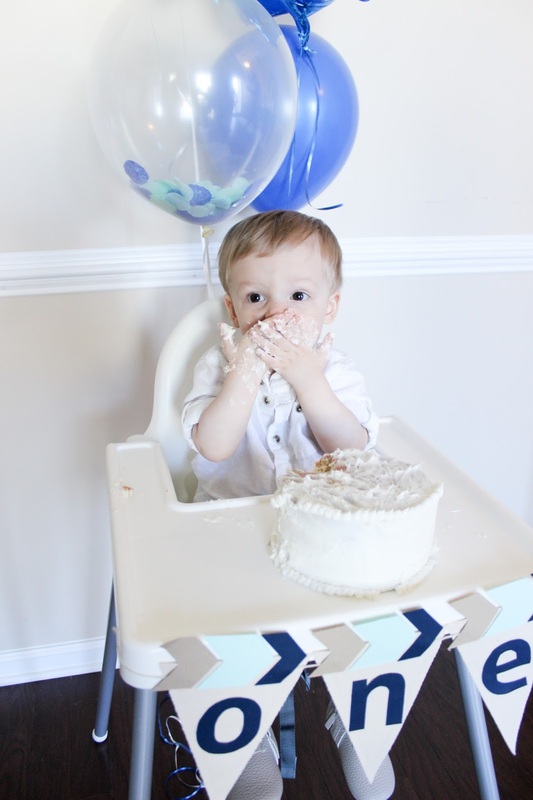 He didn't make a huge mess but the frosting made a nice film all over his highchair and his face. We were still cleaning the frosting smell out of his hair two days later! I made the banner by using a premade banner from Michael's and busting out the hot glue gun to attach the letters and arrows. This was a total last minute decision because I could not think of what to do on his highchair but I love how it turned out! 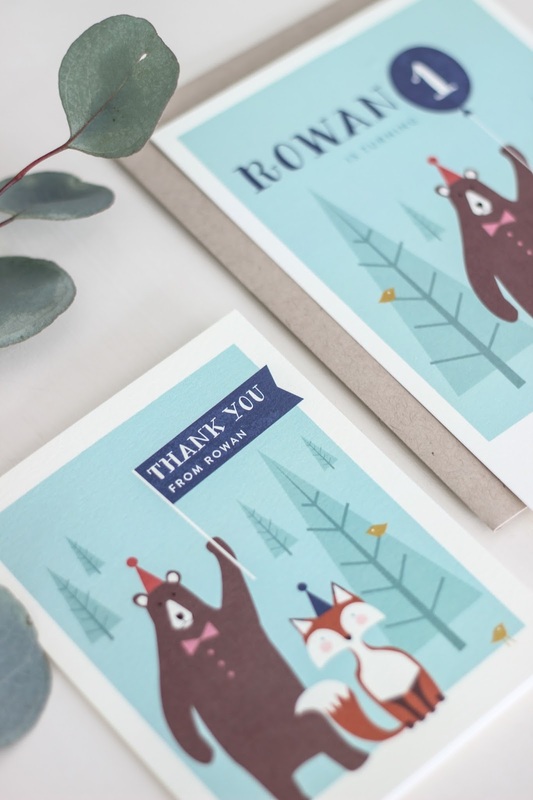 Thank you to Minted for generously providing supplies for this party! And thank you to my readers for supporting the brands that make this blog possible! 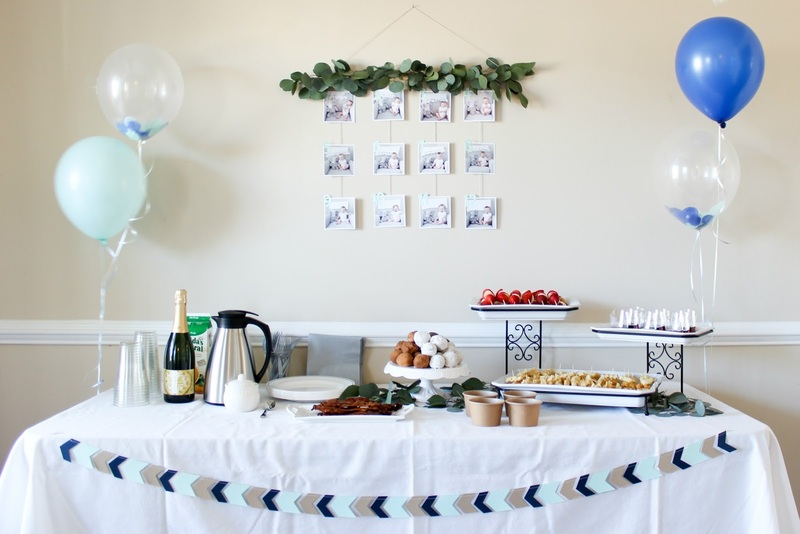 Adorable party decor and theme! He is getting so big!!! Oh my gosh - he looks SO big! Loving all of the party details! 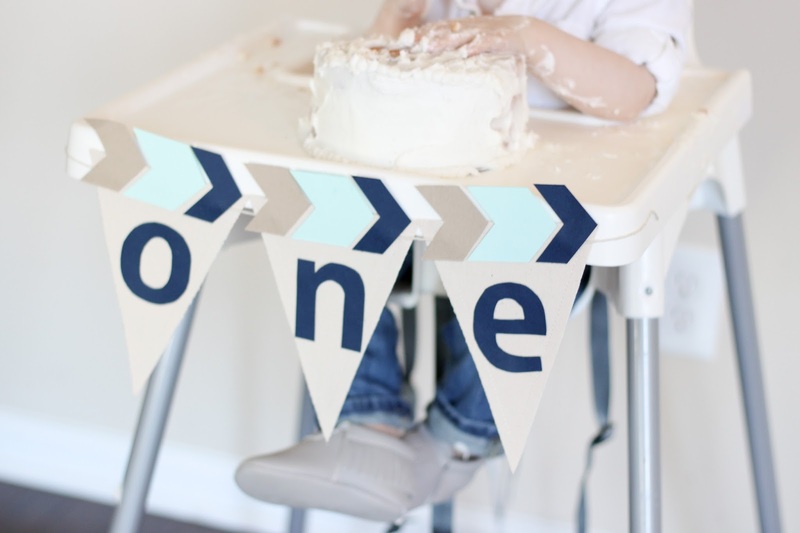 Did you make those chevron arrow banners yourself? They're so cute! Where did you get the square pictures printed? What a cute party! You did such a good job with everything from the invitations to the cakes. Happy Birthday to Rowan! You did such a great job with the party! No detail was missed! The chicken and waffles were my fav! This party is seriously gorgeous! I am madly in love with the eucalyptus. You did such a great job with every detail, from the menu to the highchair banner! This is all sorts of wonderful! Way to go mama and happy birthday little man! Such a cute party!! Everything looks so, so good! :) For my little man's first birthday, we had a 1 pm start time - right at his usual nap time. Total rookie move :/ Not doing that again for the second child when she turns one! What a great set up! Good job! Love the monthly pic display! What a good idea! This is such a beautiful party! I know all things boy aren't supposed to be beautiful but you did such a wonderful job! It turned out great! This is magazine perfect!! Love all the woodsy touches. 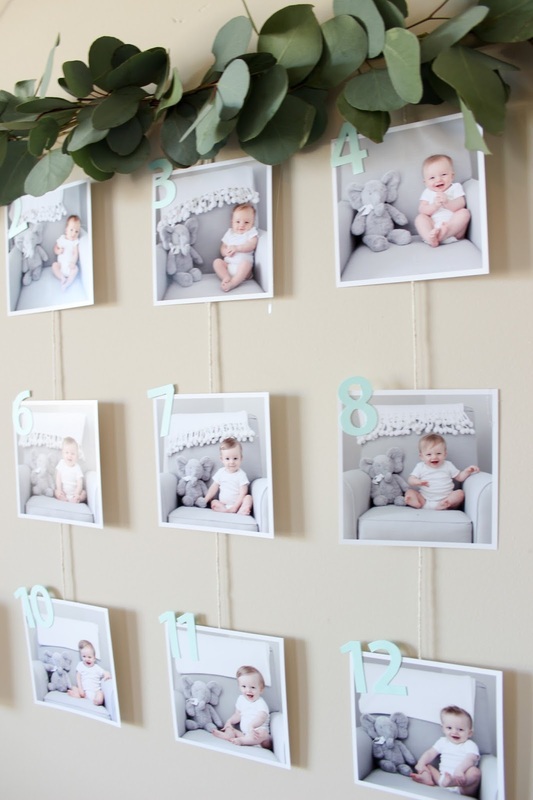 The 12 months of photos under the garland is such a creative idea. This is so dang cute! I adore the garland for his monthly photos! 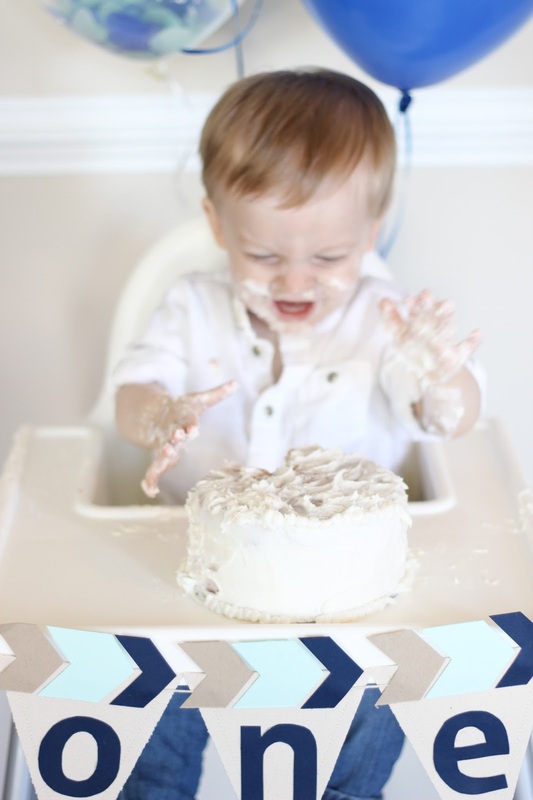 Cake smash picture are always my favorite! Love love love how everything turned out! Happy Birthday to your big boy! !